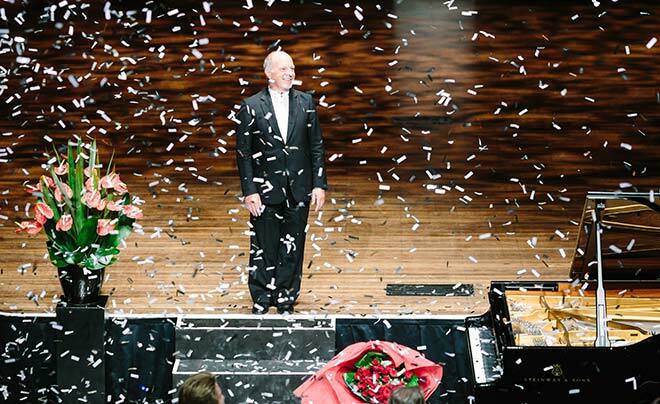 Pianist Michael Houstoun acknowledges the standing ovation in the Michael Fowler Centre, Wellington, at the conclusion of a series of concerts in which he played all 32 of Beethoven's piano sonatas during 2013. He performed in 40 concerts around New Zealand to celebrate turning 60 that year. Houstoun chose to return to New Zealand after winning prizes in the Van Cliburn International Competition (1973), the Leeds Competition (1975) and the Tchaikovsky Competition (1982). One of New Zealand's most acclaimed musicians, in 2012 he was made a Companion of the New Zealand Order of Merit.